For the latest on Bradley Manning’s situation and a regularly updated ‘about’ page, see the international support network website at bradleymanning.org. Private First Class (PFC) Bradley Manning, a US army intelligence analyst, has been in custody and was held in solitary confinement for over ten months from May 2010, when he was arrested in Iraq on suspicion of leaking the Collateral Murder video. The video shows the July 2007 US attack in the Iraqi suburb of New Baghdad, shot from the gun-sight of one of the US Apache helicopters involved. Around a dozen people, including two Reuters journalists, were killed. Two children in a van driven by a rescue party were seriously injured in a further US attack. The US initially claimed that all the dead were Iraqi ‘insurgents’ and that the killings took place in a ‘battle’. Reuters had been trying to obtain the footage from the primary helicopter involved since August 2007, but it was WikiLeaks that eventually released the video evidence of what really happened that day. Bradley Manning has been charged with leaking this footage. He is also suspected of being the source of the Afghan War Diary, the Iraq War Logs and hundreds of thousands of previously secret diplomatic cables to and from US embassies around the world. Manning was initially held in Kuwait before being moved to Quantico military jail in Virginia, US, where his conditions of detention amounted to torture and were later condemned by the UN Special Rapporteur on Torture. After a huge international outcry, and once it became clear to his captors that Brad wasn’t going to implicate Julian Assange, he was eventually moved to Fort Leavenworth military jail in Kansas in April 2011, under less restrictive conditions. Until Julian Assange hit the headlines big time, Bradley Manning’s name and his plight had been barely mentioned in the mainstream British media once the initial interest in the release of the Collateral Murder video had died down. Much of the mainstream coverage since that time has ignored Brad’s likely motivation for blowing the whistle on war crimes and has instead painted a picture of him as mentally unstable. The anti-war movement over here has manifestly failed to take up his cause, even though Brad has Welsh and Irish connections: his mother is Welsh and his early teenage years were spent in Wales. His grandfather was from Dublin. Bradley Manning is a dual US/British citizen. 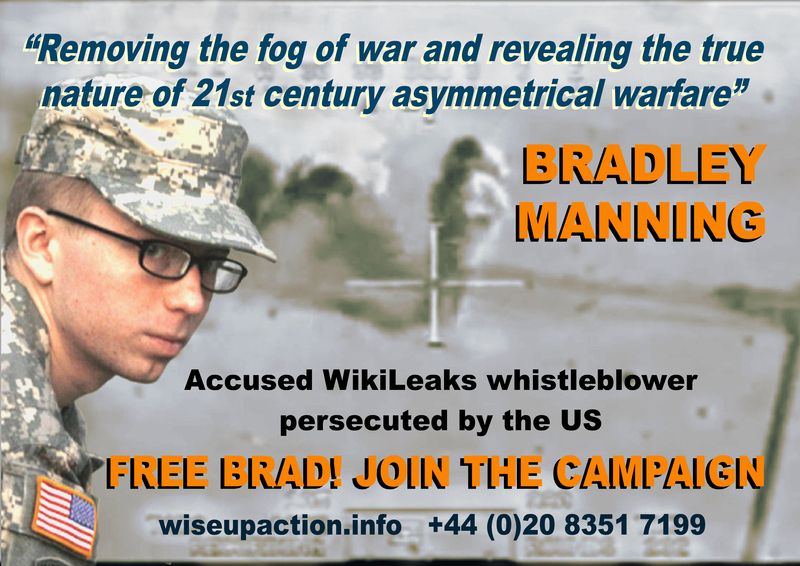 Read more about this and why UK Friends of Bradley Manning consider it to be important here. Bradley’s Welsh mother Susan met his American father while Brian Manning was serving in the US Navy and stationed at the nearby Brawdy barracks. The couple married, had one daughter and later moved to the US where Bradley was born in Crescent, Oklahoma. Bradley Manning is not Crescent’s first major whistleblower. The Kerr-McGee Plutonium plant near Crescent manufactured pellets used to make fuel rods for nuclear power stations. It was here in 1974 that a young union activist, Karen Silkwood, having already raised concerns with the Atomic Energy Commission, died in mysterious circumstances while driving to meet a New York Times journalist to show him a dossier of documents allegedly exposing widespread health and safety violations and serious contamination risks at the plant. After the accident, the dossier had apparently disappeared from Karen’s car and was never found. Kerr-McGee closed down its nuclear plants the following year. A subsequent civil action taken on behalf of Karen Silkwood by her surviving relatives was to become the longest civil trial in Oklahoma’s history. So, it was in Crescent, Oklahoma with this background that Bradley spent the greater part of his childhood. However, when he was 13 his parents separated and Bradley moved back to Wales with his mother. They lived in Haverfordwest and Bradley went to high school here for three years before returning to the US. He followed his father into the military aged 18. Bradley’s mother and his extended maternal family still live in south west Wales. In August 2010, some months after Bradley’s arrest, FBI agents accompanied by a Welsh Police sergeant turned up unannounced at his mother’s home, interrogated Susan Manning, who is in ill health following a series of strokes, and searched Bradley’s bedroom before leaving Susan in a distressed state after her sister intervened and demanded that the police and FBI should leave. It appears that Bradley Manning made his choice and the results of this are now ricocheting around the world. Bradley, meanwhile, ‘celebrated’ his twenty-third birthday in solitary confinement in a military jail in Virginia, being held in conditions which are inhumane and amount to torture. 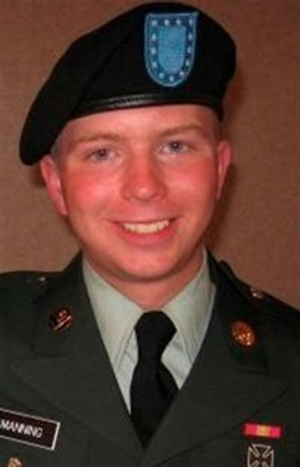 According to David E. Coombs, Bradley Manning’s lead civilian attorney, Bradley’s ‘home’ at Quantico was a 12′ x 6′ cell without sheets, pillows and devoid of any personal effects, from which he was released for just one hour of ‘exercise’ each day, during which time he was allowed to walk, and only walk, round and round a different room. He was not allowed to exercise in his own cell. Conditions at the detention facility at Fort Leavenworth are reported to be less punitive and allow association with other prisoners as well as regular exercise. Bradley has now been charged with offences including ‘aiding the enemy,’ potentially a capital offence. Prosecutors have said that they will not be seeking the death sentence, but Bradley Manning could well spend the rest of his life in jail unless we act to make this impossible. On 18 December, the Independent reported that Bradley is likely to be under intense pressure to enter into a plea bargain with his accusers, to place WikiLeaks’ Julian Assange in the frame in return for an agreed fixed term sentence for himself, although he has shown no signs of going along with such a deal to date. Irrespective of whether he actually carried out the acts he is suspected of and irrespective of whether he is ultimately convicted, he is a casualty of the typically repressive treatment of whistleblowers everywhere, designed to discourage others from speaking out in the face of injustice and cover-up. For instance, Mordechai Vanunu, who blew the whistle on Israel’s nuclear weapons programme, was jailed for 18 years, spent 12 of them in solitary confinement and is still not free to travel or to communicate with the outside world. Such treatment is designed to let us know that we live in a world where honesty, openness and integrity, particularly when it exposes things the imperial powers would prefer us not to know, will be severely punished. There have even been calls from right-wing Republicans for Bradley Manning’s execution. He is likely to spend the rest of his life behind bars, unless such a groundswell of public pressure and outrage at his incarceration makes a lengthy detention politically impossible to sustain. Bradley Manning needs our solidarity and support now more than ever. Please get involved and do whatever you can wherever you are.